In terms of historical events in Iowa during the early 20th century, what better coverage could be given than the book, Was This Heaven?. Lyell D. Henry, Jr. has done an exquisite job of depicting pioneer life, and the effect that the implementation of the postcard had on life in Iowa. It is very admirable what input David A. Wilson was able to contribute to this endeavor and as Lyell D. Henry states, “this is David A. Wilson’s book as much as it is mine”. In an attempt to track down David A. Wilson to see if his collection still exists, in a phone call on December 21st, 2013, Lyell Henry acknowledged that Wilson was deceased. While I did not proceed to inquire if there was knowledge of the collection’s current status, one’s curiosity might stretch to the State Historical Society of Iowa’s collection for comparison. 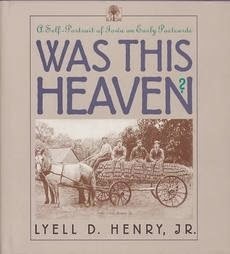 The reading of this book, I believe, will bring the viewer as much enjoyment as it did to Lyell D. Henry, Jr. These depictions are phenomenal pieces of Iowa history. There are so many great images, how can I pick a favorite? Would it be the Rural Free Delivery cart seen on page 12, or the Penitentiary convicts on page 40, or how about the vintage image of the Cyclones versus the Hawkeyes on page 222? Take a look and pick your favorite!